Social media is important to writers, whether it really works or not. It takes up a lot of time, whether it really works or not. Soon after getting started on Twitter, I looked into one of the programs that's supposed to allow users to schedule tweets because that's supposed to help with the time part. It looked so complicated, I thought it would just be easier to keep doing what I was doing. Whether it really worked or not. This past Fourth of July, my nephew, who is part of a group blog and a Twitter user, told me about Tweetdeck. What interested me was that in addition to using it to schedule tweets, he said he used it to check out interests/hashtags and find new people to follow. Following others is a way to increase your own followers. I thought, Who doesn't want more followers? So I decided to look into it. It took a while to get the hang of it, but I'm loving Tweetdeck now. It is a time saver. Additonally, I can save you some learning time by explaining what I did, so you can do it without dealing with my struggles. Like everything else in life, all the information the Tweetdeck people give you makes sense, once you understand it. Until then, think of Tweetdeck as a way of organizing your Twitter stream. I go further and think of it as a filing system. I understand filing. Good filing makes a difference in managing time. When you have hundreds of pieces of paper, if you can break them up into categories and organize them that way, you can find what you want. When you have thousands of tweets, if you can break them up into categories and organize them that way, you can find what you want. Or more of what you want, anyway. Quite honestly, when I went to Tweetdeck the first time, my Tweetdeck page came up with columns called "Home" (which was my Twitter feed from my regular Twitter page), "Notifications," and "Messages." "Notifications" and "Messages" were the same "Notifications" and "Messages" that appear in the drop down menu on a regular Twitter page. (Twitter owns Tweetdeck now, you might have guessed.) They were just in columns so I could see them immediately without having to make any effort. So Tweetdeck gave me my start. 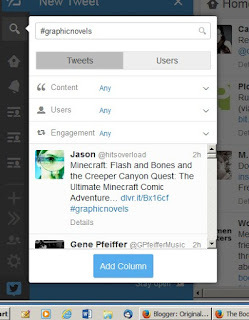 My starting point was what I had on my traditional Twitter page, but organized in columns. To build on your start, you're going to want to add more columns. To do that, all you have to do is go over to that narrow black column on the far left that I've done such a poor job of copying for you. Look for the + sign. You know, + as in add. When you hit that, you get a screen full of options that you can, indeed, add to your Tweetdeck page. They are all different kinds of columns. Twitter feed. If, like me, you removed your Home and Notifications columns, you can easily put them back up. If, like me, you put everyone you followed on Twitter into lists the moment you followed them, you can make columns for any of those lists. You can make columns for any of the subjects you see here. But What About Hashtag Columns, Gail? Now this is where I can really save you some time. I had to do some hunting to figure this one out. 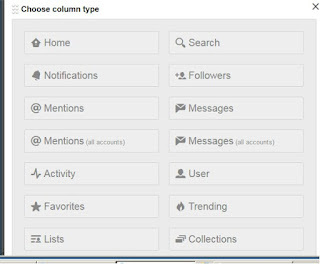 To make a hashtag column, you select "Search" from that screen full of options. Ta-da! In the little box that pops up, you type #whateveryouwant. By that I mean whatever hashtag you want to make a column for. Once you do, you'll get the box to your left. I ignore everything in it and hit "Add Column." 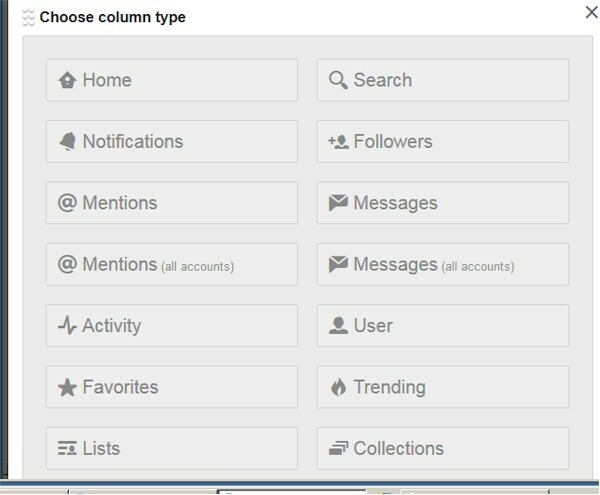 Now, what if you want to cut down on the number of columns by including two hashtags in one of them instead of one hashtag in two of them? Bless you, Alice Keeler at Teacher Tech for 'splaining how to do this, because I really wanted to give it a go. If you use "AND," you'll only get tweets that use both hashtags. OR means you'll get tweets with either hashtag. This OR vs AND thing is supposed to have something to do with Boolean logic, whatever the hell that is. But it's a cool term to use, and this is probably going to be my only chance, so there it is. In case you hadn't noticed, you need to cap the OR. So this is the how-to portion of our program. Next week I'll cover my positive experience with Tweetdeck once I figured out this stuff. I'll include scheduling tweets and attaching images.